Q: I don’t understand the Pi rebate being offered for Leopard. A: The Pi is offering a rebate on your membership renewal if you show proof of purchase of either Leopard (if you have a PowerPC-based machine) or Snow Leopard (if you have an Intel-based machine). This push is done as both an incentive for renewing but also as a means of uncomplicating Pi tech support questions: if most of our members are running some version of Leopard, it is much easier to provide Pi services to them. Q: I have a MacBook Pro running Leopard and it doesn’t want to go to restart or go to sleep. I tried launching Activity Monitor but it won’t open. A: Leopard insomnia is not that common since leopards, like most cats, enjoy sleeping. Activity Monitor (located in the Utilities folder) is the best tool for detecting sleeping problems on the Mac as it shows what programs are active and how resource hungry they might be. If a program has become unresponsive, it shows that, too. An inability to go to sleep usually means one or more programs have hung (i.e., the program has encountered serious difficulties and is no longer communicating with the outside world). The first step is to identify the program and, using Activity Monitor, check on its status and Quit the program. If the program refuses to quit, Activity Monitor also allows you to Force Quit. If you can’t use Activity Monitor for some reason, see if CMD-tab brings up a list of running programs: press the Command (cloverleaf key) and, while holding it, press tab. If the Finder is responsive, a list of icons of all open programs should appear on the screen, and you can usually figure out which one is acting strange. If you can’t launch Activity Monitor and you can’t get CMD-tab to work, go to the Apple menu and scroll down to the Force Quit menu. The menu should open and show all active programs, and if one of them is unresponsive, should indicate that as well. Force quit the program, and then reboot your computer to clear any leftover garbage in memory. When all else fails, hold down the Power key until the Mac shuts down. Then, when you boot it back up again, immediately launch Disk Utility and use the First Aid tap to Verify your drive, checking for any directory damage. Q: I used Font Book to look at and verify my fonts. It found some bad fonts, which showed up in red and which I removed. But it also listed some others and it said, “proceed with caution.” What should I do? A: Font Book is a very cool, standard Apple utility that most people have never used. Among other things, you can use it for printing out samples of all the fonts on your Mac – and you have more than you ever imagined – or, if you don’t like using paper, you can “print” the samples to disk as a PDF. You can use Font Book as sort of a Disk Utility for fonts. Launch Font Book, select Validate Font from the menu, and then select one or all your fonts to validate. Font Book will pass fonts without any problems, flag some with minor problems and tell you to “Proceed with caution,” and identify fonts with serious problems that should be deleted. In most cases, the fonts flagged as “minor problems” are older fonts that you brought forward from the days prior to Mac OS X, or to fonts installed by Microsoft as part of Office. Often they will be flagged because, if you’ve installed more than one version of Office, for example, you’ll have duplicate versions of the same font in different places. Generally speaking, duplicates shouldn’t cause any issues, but if you do experience problems, get rid of the duplicates and, if that doesn’t make things more stable, investigate the other “problem” fonts. Do note that deleting some fonts will cause Mac OS X to stop working. Q: I’m trying to send a PDF via E-mail, and when I attach it, it immediately opens (displays within Apple Mail). I want it to be closed. A: The good news is: unless you send the E-mail to another user who uses Apple Mail, it won’t be displayed within the message; Apple Mail is the only mail client that displays PDF documents, or TIFF documents, or a number of other file formats. If it bothers you, you can right-click on the PDF and toggle it between “View in Place” and “View as Icon,” but it won’t make any difference for the recipient. Conversely, if you want your fancy formatting to be seen by Windows users, for example, you can use JPEG images and HTML formatting. Even then, many E-mail clients, Mac and PC, won’t display anything but text, so your fancy formatting will be decidedly plain. Q: If you do format something fancy, is there any way to keep it from falling apart after it gets forwarded and forwarded and forwarded…? A: The quick, easy and cheap answer is: turn your heavily formatted E-mail message into a PDF or a JPEG image. Then mail them the file; it is no longer text, and will survive forwarding and any number of indignities. Of course, since it isn’t text, it also is larger and more cumbersome. Note that virtually any Mac program can produce a PDF (if all else fails, “print” the file to a PDF). Q: How much does the rest of the world pay for ISPs and what speeds do they get? A: Not sure if this is entirely a Mac question but the answer is: the US is anywhere between 15th and 25th worldwide in terms of broadband access. South Korea and Bermuda have the highest broadband penetration and some of the lowest rates; Japan has the fastest average speed (Japan, like most countries, requires carriers to open their lines to competitors, and offers speeds up to 100 Mbps). France is currently debating, at the national level, whether broadband access is a citizen right; Finland has already decided that this is, indeed, a right. In general terms, US broadband is also the most expensive. On the other hand, the US is many times the size of the countries that have more widespread access; wiring Bermuda is not nearly as challenging as wiring Wyoming or Alaska. Q: Sometimes when I print something with Firefox it is all jumbled; when I print it with Safari, it isn’t. What’s the difference? A: Unfortunately, there is no general rule, standard, or technology requirement to make Web pages printable. Web site designers don’t test their sites by printing them; Web browser designers don’t test their browsers by printing pages. A Web browser is designed to make a Web site display in a Web browser; that’s it. Some may look fine printed with Safari, others may look fine printed only with Firefox, yet others will look fine only when printed with Internet Explorer. Only a tiny fraction of all pages are designed to be printed (receipts, invoices, applications); nothing else is even tested to see if it prints. Q: I have a MacBook from 2007 and am thinking of upgrading to Snow Leopard. I decided to test the laptop by running some hardware tests, and got a memory error. I reset the PRAM and all that, reran the tests, and still got the error. I used third-party RAM; is that likely to be the cause? A: Memory problems are indeed one of the most common problems people have when they upgrade their operating system. Mac OS X 10.5 was less tolerant of poor RAM than 10.4, and Mac OS X 10.6 is less tolerant than 10.5. At each step, Apple tries to squeeze more and more performance out of their computers, which is good, but this process also means marginal components are more likely to cause problems. Snow Leopard, in particular, is designed to run without any constraints. It isn’t waiting for its slow cousins, the Macs with PPC processors; it is running all out. So it is entirely possible that memory might work fine with Leopard (Mac OS X 10.5) and have problems with Snow Leopard (Mac OS X 10.6). Given the plummeting cost of memory, and the fact that bad memory can literally scramble every single bit of data on your computer, you are better off heeding the warning and getting replacement RAM than gambling. Many vendors (Crucial, Kensington, Other World Computing) will guarantee their memory; if you bought your memory from these vendors, submit a claim and get it replaced. Q: Upgrading to Snow Leopard, what should be the minimum RAM? A: Apple says 1 GB, but – why? Get at least 2 GB. As previously noted, RAM is cheap right now, so make sure you have at least 2 GB, and if you want to run Parallels and Windows XP, 4 GB – or more. Snow Leopard makes better use of memory than Leopard, so there is no reason to get strange and max out your RAM with 32 GB; even big-time videographers will probably find 12-16 GB to be plenty. For most normal people, 2-4 GB is fine. Q: Can you run Windows 98 under Parallels? A: The answer is “Yes, but it should be illegal.” Windows 98 was a dreadful operating system. It was suggested that you could go out and buy a cheap PC to run this program, but then you have a much greater burden: updating and keeping current two sets of hardware and software. There is almost no way to keep Windows 98 from getting instantly infected by worms, viruses and such if it comes in contact with the Internet. Q: I’m getting pieces of spam, over and over. I empty the trash and they come back. I’ve contacted the vendor and they say they aren’t the source of the E-mail. What do I do? A: Generally speaking, nobody cares about spam anymore. Most vendors do not send out the spam bearing their names. Contacting law enforcement doesn’t do any good, either; they have other, more critical things to worry about. Setting up your mail client to flag spam, and deleting it, is about the best you can do. Spam techniques, and the viruses and worms that they carry, change almost daily. It is something you must live with, like people who run stoplights and weave through traffic, or cut in front of you without signaling. Q: You say you should just delete the spam, without opening it, but when you select it, it opens. A: If you are using Apple Mail, you can fix this. Apple Mail defaults to a three-pane view, with folders (mailboxes) on the left, the mailbox message listings at top, and the message displayed on the bottom. Pull the divider between the message listings and the messages all the way to the bottom of the frame; it will then disappear. At that point, you can select one message, or fifty, and delete them, all without opening them. If you really do want to read a message, double-click on it and it will open in a new window. Q: I use Apple Mail. When I empty the trash, but it then comes back. Why? A: This often happens if you have Apple Mail set to POP (Post Office Protocol). Depending on how you have set it up, deleting messages on your Mac does not delete it on the server. You either need to adjust your POP settings to make sure the server copy is deleted, too, or, if it is offered, switch your mail account to IMAP, a much more modern approach to mail storage. Q: What is the best Mac OS 9 emulator? I want to use Snow Leopard, but I have 15 years of material that uses a Mac OS 9 program. A: The best answer is to get a Power Mac G4 running Tiger and run these programs under Classic. Don’t even try to run them on your new machine under Snow Leopard. Q: I don’t understand the speed listed on CD-ROMs. A: The speed rating is for how fast you can write data to the disc. The original writeable drives could write (“burn”) data at 150 kilobits per second. Blank CD-ROMs advertised as 48X are, therefore, 48 times faster than the original, and can write data much faster, 7,200 kilobits per second. Most modern drives have multiple speeds, one speed for writing CD-ROMs and another, much slower speed for writing DVD discs. Q: What is the difference between a blank music CD and a blank data CD? A: The standard data CD format is known as ISO 9660; anything written on an ISO 9660 CD should be readable on virtually any modern computer. An IS) 9660 CD-ROM can be no more than 650 megabytes in size. If you record music on such a CD, it will hold roughly 74 minutes of music. “Music” CDs are often the same media, but they are designed to be formatted as 700 megabyte discs, and will hold up to 80 minutes of music. Since these discs are not a standard format, there is no guarantee they can be interchanged between machines. After a brief break and discussion of the Pi’s Leopard Rebate program (see the Pi Web site for details), Larry Kershberg talked about cloud computing. Rather than reinterpret his presentation, you can see and hear it all on the Pi Web site, thanks to Profcast, a very popular tool for recording presentations and turning them into streaming video and podcasts. The presentation is available in two different flavors; the iPhone version is designed to be playable on an iPhone or iPod touch. Note: the presentation has sound, but the first several seconds are very quiet, so patience. Also, this is a slide show, so don't expect much movement. After lunch, Clay Ellington, the Apple campus representative for George Mason University, did an excellent overview of Snow Leopard. It was highly interactive, very informative -- and nobody was taking notes. So take our word for it: you missed something special. And you also missed the raffle in which the Pi gave away several copies of Leopard to astonished winners. The September 26 General Meeting will be a double-header event with two presentations by Pi members. The morning session starts at 9:30 a.m. and ends at 12:15 p.m. The afternoon presentation is scheduled for 1 p.m. and will end around 2 p.m. with a special Leopard Raffle (cat box and kitty litter not included; more details to come). This month’s meeting will be packed with information starting with the usual Question & Answer session right up front. We encourage advanced questions, which can be sent to feedback@wap.org. Following the Q & A session, any important club announcements will be presented followed by a short coffee break. Billions and billions of servers, e.g., Apple, Google, Microsoft, Yahoo, Amazon, etc. Files backups to the Cloud -- iDisk, SugarSync, Dropbox, etc. Change: we now have an Apple representative, Clay Ellington, who will provide the afternoon Snow Leopard presentation. Clay is the Apple Student Representative for George Mason University and is fully versed on the important nuances of this new feline operating system from Apple. Bring your questions and interest; you won't be disappointed, and by the end of the day, you should be armed with enough knowledge to decide if this upgrade is for you. The special Leopard Raffle closes out the meeting. We are giving away 10 copies of Mac OS X Snow Leopard. Come to the meeting and you might be one of the lucky winners! Also, the Pi will be hosting the George Mason University Mac User Group at this meeting. Come meet more Mac enthusiasts! There will be no iLife SIG or members helping members session at this meeting. The meeting is being held in Enterprise Hall, Room 178; No. 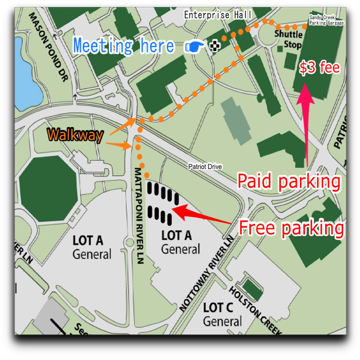 13 on GMU campus map (see link above). The closest parking is in the Sandy Creek Parking Garage, a pay-for-parking facility. Park in Visitor area, the lowest level. Take the elevator to the third floor (Campus Level), and you will be at the correct level for the short walk to Enterprise Hall. The Pi is subsidizing parking. Parking Validation tickets will be available from designated volunteers for a $3 donation; they will fully cover all parking costs. You will need both your parking ticket and the validation ticket to exit the parking garage. When leaving the garage you will want to use the exits marked for Prepaid Tickets. Your parking ticket, the one you got when you drove in, goes in first. Then the validation ticket goes in next. If you have any problems, there is a speaker box for calling the parking lot attendant.